Most of these links will open in a new browser window and take you out of the Judi Bari website. To return here, close the browser window that contains the external site and switch back to the window containing this one. Even now, the corporate media and the employing class promote the myth that timber workers and environmentalists have nothing in common. 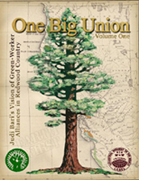 However, as early as 1985, timber workers and environmentalists began to fight together against unsustainable corporate timber practices in the “Redwood Empire” of northwestern California. When long time labor activist Judi Bari joined Earth First! and brought the IWW back to timber country in 1988, real grassroots opposition began to grow in timber country. This book chronicles the early years of these struggles and how a divided community began to overlook their differences and fight against the real outside agitators: multinational corporations. The struggle is no less relevant today as multinational corporations continue to receive massive bailouts, working people struggle more and more just to make ends meet, and global warming threatens not only old growth forests, but civilization as we know it. The Forest For The Trees - Award-winning documentary film about Judi Bari and the FBI trial, produced and directed by Bernadine Mellis, daughter of Judi's lead attorney Dennis Cunningham. The No Pepper Spray website - Non-violent Headwaters Forest protesters had pepper spray soaked Q-tips put into their eyes by Humboldt County law enforcement in 1997. Shocking police videos drew international outrage when they were broadcast by network TV. The activists sued in federal court for violation of their 4th Amendment rights by excessive force, and got a hung jury in their 1998 trial in San Francisco federal court. Instead of granting a new trial, the judge threw the case out. The activists appealed, and the 9th Circuit overturned the trial judge and granted a new trial. Defendants appealed and it went all the way to the U.S. Supreme Court, which upheld the activists' right to a new trial. At this point the Bari/Cherney legal team took over representation of the Pepper Spray plaintiffs. They got the original judge removed from the case for the appearance of bias, and took the case to trial twice more, finally winning a unanimous jury verdict in April 2005.
www.albionmonitor.com, a progressive online newspaper, one of the Internet's first, which regularly covers the Bari/Cherney bombing case and many other activist issues. A Short History of FBI COINTELPRO by Mike Cassidy and Will Miller, a very brief treatment based on Brian Glick's War At Home: Covert Action Against U.S. Activists and What We Can Do About It, (South End Press; Boston, 1989). The linked article was reprinted in the Albion Monitor as a sidebar to "The Judi Bari Bombing Revisited: Big Timber, Public Relations and the FBI" a review and analysis of the case by Nicholas Wilson. COINTELPRO site by Paul Wolf, an excellent resource on the FBI's sordid history of domestic covert operations, including the complete "The COINTELPRO Papers --Documents from the FBI's Secret Wars Against Dissent in the United States" by Ward Churchill and Jim Vander Wall. Paul is currently adding major portions of the Church Committee reports of the 1976 Congressional investigation of the FBI and CIA. COINTELPRO -- another good reference page by Paul Rivero. The Campus Files - San Francisco Chronicle special report on FBI spying and political repression on the UC Berkeley campus during the sixties, including collusion between then-governor Ronald Reagan and J. Edgar Hoover. Researched and written by award-winning journalist Seth Rosenfeld. Published in 2002. Mendocino Environmental Center Home Page including the MEC quarterly newsletter containing articles by Judi Bari. Mother Earth - The Activist Nexus contains Judi Bari and Darryl Cherney info, and much more. Free Leonard Peltier, COINTELPRO target and American Indian Movement political prisoner, wrongfully convicted and imprisoned for a quarter century. This link is to the website of the the International Office of the Leonard Peltier Defense Committee, an authorized group which works directly with Leonard toward gaining his release. Common Courage Press, publisher of Judi's 1994 book Timber Wars. Greenpeace Australia has a website called Get Active, a one-stop-shop for anyone wanting to learn how to set up and run a community campaign, lobby politicians, organize peaceful protests, inform the media and much more including hot-links to the world's best activist sites. The Public Relations Industry's Secret War On Activists by John Stauber & Sheldon Rampton of PR Watch, published in Covert Action Quarterly Issue #55, Winter 1996. "Using spies, infiltrators, phony grassroots campaigns, smear techniques, and high-tech media assaults, the PR industry is targeting its biggest enemy: local activists." Note that the main link above now goes to a copy of the original mediafilter.org site in the Internet Archive Wayback Machine, a handy link for finding copies of defunct websites or copies of websites before they were changed.